Happy Memorial Day! Thank you to the men and women who have served our country. The Dallas Symphony played a concert at White Rock Lake tonight, complete with fireworks. I threw the football until I was a sweaty mess, and then enjoyed a delicious brisket. 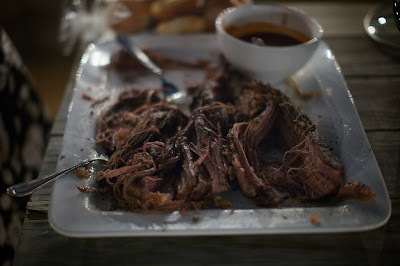 I recently learned the secrets to making a good (and fairly easy) pulled brisket. I tried to stray from the recipe, and it was not pretty. Stick to the basics. This brisket is so tender and makes perfect sandwiches. 1. Season brisket with steak seasoning. Heat oil in large skillet/pot over medium heat, and brown brisket on all sides for 2 minutes each. 3. Place sealed bag in large roasting pan and poke a few holes on top to release steam. 4. Cook in oven at 275 for 5 hours. Let cool for 15 minutes. Remove from bag, and pull brisket apart with a fork and fingers. 5. Serve on potato rolls.